Following Bradford Knapp's resignation, the business and professional people of Auburn asked Governor B.M. Miller to appoint Luther N. Duncan, director of the Extension Service, interim president. They cited his financial acumen, his knowledge of the college and the state, and his political and diplomatic skills as qualifications. In a statement mailed to alumni, Duncan replied that he was not an applicant, for the job should seek the man. He just wanted to serve Auburn in the best possible way. The alumni letter flushed out Duncan's opponents. The Birmingham News, published by Trustee Victor Hanson, called Duncan "a master of political trickery" and reminded readers of past collusion between the Extension Service and the Farm Bureau. Furthermore, many believed that Duncan had been campaigning for the presidency for some time. One wrote scornfully that his alumni letter was a sham. Had he been serious in not seeking the presidency, Duncan never would have written it. Furthermore, if he was not seeking the presidency, he should silence those lobbying in his behalf. Meanwhile, on July 28, 1932, the board met to appoint a presidential search committee. The same group was empowered to name an acting president, which they planned to do on August 5. Duncan's supporters criticized the board for failing to name an interim immediately. One urged them not to seek "someone from a distant place." Another feared the introduction of too much "Yankee" influence. Many considered Duncan not only the best interim choice but a strong candidate for the permanent job. Trustee Hanson led the opposition to Duncan. On August 5, the board deadlocked in their attempt to name an interim president. According to one observer, Hanson brought "the full power of all the leading dailies of the state" to his aid in attacking Duncan's candidacy. Governor Miller yielded to Hanson when "it became apparent that to do otherwise meant a fight in the press along other lines and extending into other things." As a compromise, the board appointed a three-man executive committee composed of Duncan, John J. Wilmore, dean of engineering, and George Petrie, dean of the Graduate School. Petrie refused to serve and urged the governor to appoint an interim president. Hanson wanted Wilmore named chair of the committee, but Miller insisted that the group select its own leader. They chose Wilmore as chair and selected Duncan as secretary. The board had added Bolling H. Crenshaw to the triumvirate when Petrie refused to serve. Early the following year, the committee made its first report to the board. They had found that the college owed $160,000 for various supplies and expenses. Approximately $300,000 had been borrowed from this operating fund and placed in the building fund in anticipation of payment on state building warrants, which never materialized. They also found $10,000 in unpaid interest on loans. The treasury was empty and the committee had been forced to borrow money to purchase stamps. The faculty and staff, who had been paid in certificates of indebtedness for the past ten months, had been informed that no one could be assured of a job after July 1, 1933. No concerted effort had been made to register students for the fall quarter that had just ended. President L.N. 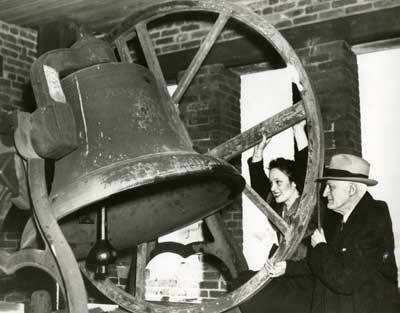 Duncan signifies the start of a Greater Auburn Day and a $1.5 million building project by ringing the bell in Samford Tower that had remained silent for years. Because of his budgetary experience as extension director, Duncan played a crucial role on the administrative committee during the coming months. As of September 30, 1933, the end of the fiscal year, the college had paid forty-five percent of budgeted salaries. Early in 1934, the board authorized the committee to obtain all state bonds due to the college, to exchange the state building warrants for bonds, and to pay the school's outstanding debts with these funds. By July, the faculty were receiving sixty percent of budgeted salaries. In early 1935, when the board named a president, the choice was clear. Hanson still opposed Duncan, as did one other board member, but otherwise the extension director enjoyed solid support. One member of the administrative committee remarked that he had favored Duncan's appointment when Knapp resigned and was "still for it." During the Knapp administration, the legislature had created the Teacher-Training Equalization Fund. Under the funding formula, the University of Alabama received considerably more money for training teachers in primary and secondary education than did Auburn. The state's reasoning had been that Auburn would train teachers of vocational agriculture and home economics, but that Alabama would carry the primary burden in other areas. Auburn officials opposed this approach, undoubtedly because it relegated them to a second class position, but they also contended that most of Tuscaloosa's large enrollment in educational curricula came from outside the state. The two schools actually had nearly the same number of Alabama students enrolled in educational curricula, so the money should be split evenly. As it was, the state was subsidizing out-of-state students at the University of Alabama, many of whom would probably return to their home states to teach school. This issue came to the forefront shortly after Duncan took office. In July of 1936, representatives from Auburn, Alabama, and the state women's college at Montevallo met with the state board of education to discuss the Teacher-Training Equalization Fund. According to one report of the meeting, obviously biased in favor of Auburn, each school had been allotted fifteen minutes to present its case. Auburn and Montevallo each took their allotted time and Alabama took one hour. According to the Alabama position, the Tuscaloosa school had more in-state students enrolled than Auburn and Montevallo combined. In addition, almost all the students enrolled in their school of education came from in-state. Furthermore, the Board of Education had designated the University of Alabama the state's "official" education school, a decision consistent with the Brookings Institution report that had come out earlier in the decade. Alabama, Auburn, and Montevallo earlier had agreed to an overall funding formula of thirty-nine percent, thirty-nine percent, and twenty-two percent, respectively, but this was not intended for teacher training. 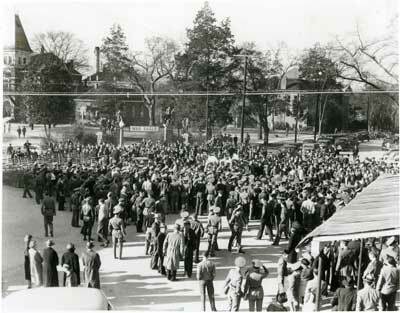 The Auburn Band, students and fans celebrate at Toomer's Corner following the 6-0 win over Michigan State in the 1938 Orange Bowl football game. The newly-elected governor, Bibb Graves, took Duncan's side when the three schools met to discuss the teacher training formula, which shortly thereafter was changed to give Auburn and Alabama equal shares of the fund. Both the president and the governor supported the New Deal faction of the Democratic Party in Alabama, so their alliance grew stronger. Duncan later reported to the board of trustees that he and other Auburn officials had worked closely with Senator John H. Bankhead and E.A. O'Neal--a longtime Duncan ally, former president of the Alabama Farm Bureau, and now president of the American Farm Bureau--in passing the Bankhead-Jones Act, which increased the school's funds for resident teaching, agricultural research, and agricultural extension. By this time, Auburn provided the administrative home for several New Deal agencies: the Agricultural Adjustment Administration, the Soil Conservation Service, and the Resettlement Administration. Duncan's political skills continued to draw criticism. Among his enemies were Harry Ayers, publisher of the Anniston Star, who was a proponent of greater coordination in Alabama higher education. Duncan took this to mean subordination of Auburn to the University of Alabama, which may have been Ayers' intent, but in any case the two men distrusted each other intensely. In 1940 Duncan successfully opposed Ayers' candidacy as a delegate to the Democratic National Convention, which deeply offended the publisher. According to Ayers, all those associated with the Bibb Graves "pie eating machine" disliked him because he stood for civil service and other reforms. Graves' loyalists included Duncan, who exercised great control over the organized farm vote. 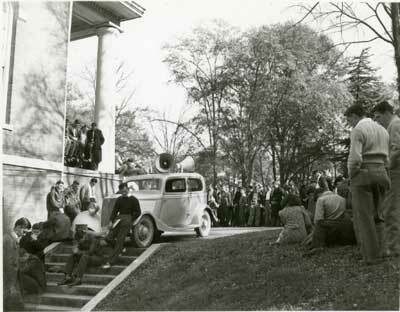 Somber students and faculty listen to Franklin D. Roosevelt declare war on Japan and Germany over loudspeakers in front of Langdon Hall on December 8, 1941, the day after the attack on Pearl Harbor. Duncan's position, at least officially, was that as extension director and president he had had to deal with politicians and political bodies. He so doing, he "endeavored to interpret and understand political methods and means to make the best possible use of them" in furthering his responsibilities. Whenever he found a politician unfriendly to Auburn's cause, he sought to make him a friend. If he could not, he opposed him. Such opposition had been carried out on an official and ethical level, not personal. He opposed Ayers, for example, because the latter had made "repeated campaigns…and numerous public addresses in advocacy of consolidating the institutions of higher learning under 'a board of control and a chancellor in charge of executive administration.'" Duncan feared that if this were done "under the average political set-up in Alabama it would paralyze the Agricultural Extension Service and forever cripple Auburn." This did not mean that he opposed the elimination of duplicate programs, provided it were done "in a friendly, cooperative way." Duncan had supporters in the media who came to his defense. The Lee County Bulletin noted that Harry Ayers had run fourth in his own county in the election to represent Alabama at the Democratic National Convention. How could he blame Duncan for that? C.M. Stanley of the Alabama Journal editorialized that Ayers was merely up to his favorite pastime: Duncan bashing. The Anniston editor had been a long-time advocate of consolidating Auburn and Alabama, "so that Auburn would become the dangling tail of a Tuscaloosa kite." Ayers now contended that pending legislation would curtail Duncan's political power, which he still blamed for his defeat as a convention delegate. Stanley contended that Ayers had been defeated after being brought into the campaign at the encouragement of forces opposed to President Franklin D. Roosevelt, but Alabama sent a solidly New Deal delegation to the convention. Ayers responded that Stanley's paper was one of the few in Alabama that still supported the spoils system of Governor Bibb Graves. Privately, Stanley wrote to Duncan that he had not intended to cause the president any "personal embarrassment," but it had been "hard to resist coming back at Harry Ayers." From Auburn's perspective, Ayers appeared as a blatant partisan of the University of Alabama. Ralph Brown Draughon, executive secretary of the board of trustees, noted that Ayers apparently believed Auburn was the only public institution of higher education in the state that ever became involved in politics. Why was it that he had never bothered to write about political activity at the University of Alabama? Ayers' problem, according to Draughon, was that Auburn had found a president who could match Alabama at it's own game. Prior to this, the school was being "coldly and systematically strangled to death," or at least choked "until such time as it should become so weak that, under the guise of Colonel Ayers' pet theory of consolidation, it could be absorbed" by the University of Alabama. Duncan undoubtedly believed in cooperation among Alabama's institutions of higher learning, although he never would have advocated it to Auburn's detriment. In August, 1942, for example, he wrote to Raymond Paty, the newly-appointed president of the University of Alabama, that the relationship between their two schools was "of such magnitude and gravity" that he had given the question more attention than any other problem he faced as president. He urged Paty that Auburn and Alabama should agree upon a funding formula that would give each institution the same appropriation per in-state student, an idea which worked against the University of Alabama's self-image as the state's capstone university. Duncan said he welcomed Paty's suggestions, provided they did "equal and impartial justice" to all concerned. In March of 1943 Duncan appeared before the interim legislative committees on education, finance, and taxation, where he argued that the state should undertake a "painstaking study…to remove all possible friction and duplication" between Auburn, Alabama, and Montevallo. He called for the committees to apply the principle of equalization so that each Alabama student would receive approximately the same level of state support regardless of the institution attended. He further called for a cooperative recruitment plan and the assignment of roles to Auburn and Alabama that allowed each school "to render maximum service" in the fields where it was best-equipped to serve. The legislature subsequently created the Alabama Educational Survey Commission, which was charged to prepare recommendations for the 1945 legislative session. Duncan appointed Ralph Draughon the chair of an Auburn committee charged to assist the commission. The University of Alabama's report to the commission argued that the Tuscaloosa school had well-established and broad responsibilities for higher education in the state. Four times in Alabama history, higher education responsibilities had been delegated to other institutions. In three of the four cases, this occurred under a state government established during the Reconstruction period: creation of the normal schools, higher education for blacks, and establishment of the land-grant college at Auburn. The fourth case was the state women's college at Montevallo. In each case, this had resulted from "the illogic inherent in the evolution of a democratic government." While it was indeed true that American higher education was relatively democratized, with the consequent scattering of resources, the Alabama report had a haughty tone that drew a sharp response from Duncan, who said that he had never seen "a bolder, more deliberate, more vicious, or more deceptive document." He predicted that if the friends of Auburn and Montevallo did not rise up to combat "this evil monster," it would consume them "just like the doctrine of Hitler." The Educational Survey Commission recommended, among other things, the creation of a central board for Alabama Higher Education and the abolition of all existing boards. Ralph Draughon, who headed the Auburn committee appointed to coordinate work with the commission, was pleased with the recommendation, but predicted that it would be opposed by the University of Alabama. He went on to say that this was the first such report in the state's history that had not been dominated by that institution. Duncan also doubted that the commission's recommendations would be approved, if only because they ran so contrary to the University of Alabama's idea of its position in the state's system of higher education. He sarcastically remarked that, according to Alabama, Auburn and other state schools were "illegitimate children…born out of the misery of the reconstruction period." Ultimately, the commission's recommendation that the state create a central board and abolish existing boards met more opposition than it could overcome. Duncan noted that this would have required a constitutional amendment, an obstacle "almost insurmountable." In 1947, after more than a decade in the president's office, Duncan faced the last political challenge of his life, which, appropriate enough, had to do with the relationship between the Cooperative Extension Service and the Alabama Farm Bureau. The previous November, Alabama voters had elected a new governor with a strong populist bent: Big Jim Folsom. In February of 1947, with the newly-elected governor presiding, Trustee Gould Beech, a Folsom appointee, called for a discussion of charges that had been brought against the Extension Service: that Alabama agriculture had suffered a relative decline during recent years, for which extension bore a major share of the responsibility; that extension had failed to cooperate with other state and federal farm agencies; that the Extension Service controlled the Alabama Farm Bureau; and that the Extension Service was engaged in constant political activity. P.O. Davis, director of the Cooperative Extension Service and a longtime Duncan ally, subsequently appeared before the board to defend his agency. The trustees passed a resolution commending Davis for his work, but condemning the political activities of the Extension Service. On July 26, 1947, President Duncan died while still in office. He left a legacyof both controversy and accomplishment. Some considered Duncan overly political, which he may have been at times, but he was always politically astute. This quality served him well as extension director and as president. He made Auburn a force to be reckoned with in Alabama politics; he defended the school's share of the state budget for higher education; and, to the extent that was politically expedient, he stood for cooperation among the state's institutions of higher learning.